Gorgeous view home in Edna Valley on five acres with 180-degree views, fireplace and large TV, vaulted tongue-in-groove wood ceilings, beautifully furnished, private tennis courts, huge deck, large bathroom with tub and shower, king bed in one room, twin in another, sofa bed in living rooms, fenced dog run, complete privacy, driveway for parking (not covered), citrus and avocado trees, BBQ etc. This is the perfect place for executive rental or home away from home. Farmhouse style with fresh paint, updated decor and remodeled kitchen. Steve is an engineering consultant and Sheryl is a painter and art gallery owner; we met while students at UC Santa Barbara. Steve enjoys mountain bike riding, surfing and golf and Sheryl is an avid hiker and yogi. We have lived in San Luis Obispo for over 30 years and our kids went to the local public schools and now live in different parts of the west coast. San Luis is a wonderful place to live and visit. Our home is on five acres and the guest cottage is on the lower half; our home on the upper. While we are close by to help when needed the 2 homes are completely private and not visible to each other. "SLO" as it is known to locals is a wonderful mix of out door activities, great restaurants, wineries and breweries, and close to Cal Poly. We have amazing views, complete privacy, a private tennis court for your enjoyment and we are half way between San Francisco and Los Angeles, and on a smaller scale, half way between the beach and downtown. We are located right in the middle of the wine area of San Luis Obispo. We are located in the wine region of Edna Valley. The views of the vineyards and mountains is beautiful. 13 miles to Lopez Lake for boating or sailboarding. 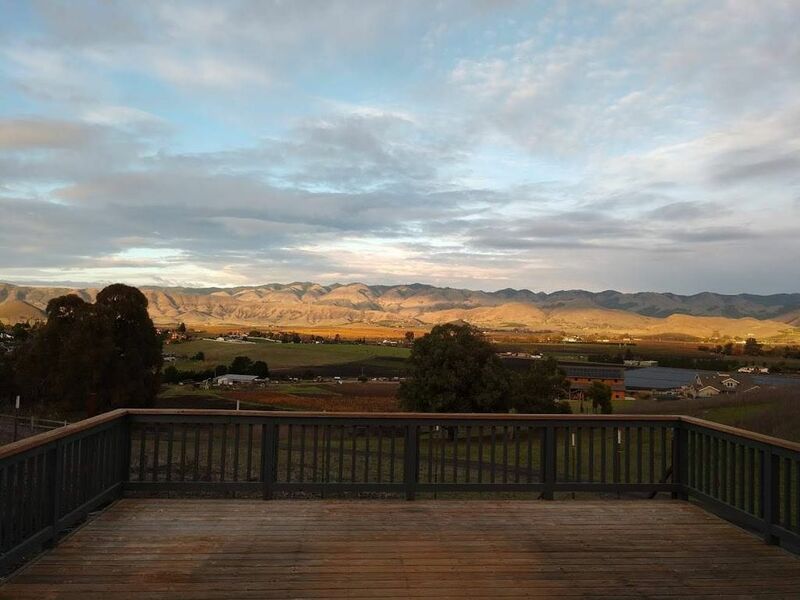 Our property is in the beautiful wine region of San Luis Obispo. We are close to Cal Poly and all they have to offer, wine tasting, the beach, breweries, small airport. There is fabulous hiking, biking, surfing and wind sailing nearby. San Luis Obispo is a wonderful family or couples place to spend a month.